Nationalism is a movement and a state of mind that brings together national identity, consciousness, and collectivities. It accomplished the great transformation from the old order to modernity; it placed imagination above production, distribution, and exchange; and it altered the nature of power over people and territories that shapes and directs the social and political world. A five-country study that spans five hundred years, this historically oriented work in sociology bids well to replace all previous works on the subject. The theme, simple yet complex, suggests that England was the front-runner, with its earliest sense of self-conscious nationalism and its pragmatic ways; it utilized existing institutions while transforming itself. The Americans followed, with no formed institutions to impede them. France, Germany, and Russia took the same, now marked, path, modifying nationalism in the process. 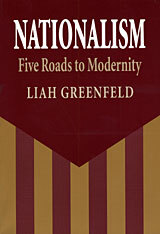 Nationalism is based on empirical data in four languages—legal documents; period dictionaries; memoirs; correspondence; literary works; theological, political, and philosophical writings; biographies; statistics; and histories. Nowhere else is the complex interaction of structural, cultural, and psychological factors so thoroughly explained. Nowhere else are concepts like identity, anomie, and elites brought so refreshingly to life.